WASHINGTON, DC, October 19, 2011 (ENS) – Hundreds of the world’s largest investors, representing more than $20 trillion in assets, today encouraged governments and international policy makers to take new legally-enforceable steps to combat climate change at the upcoming UN climate summit in Durban, South Africa. The group of 285 investors issued a joint statement emphasizing the urgent need for policy action which stimulates private sector investment in climate change solutions, creates jobs, and ensures the long-term sustainability and stability of the world economic system. The statement represents the largest group, by both number of signatories and assets under management, ever to call for policy action on climate change. Signatories to the statement include financial institutions, state treasurers, controllers, pension fund leaders, asset managers, insurance groups, faith groups and foundations worldwide. Investor support for climate action has more than doubled since November 2008, when 150 investors with $9 trillion in assets under management first came together to urge government leaders to act on climate change. Here, an assembly of CEOs, decision makers and former heads of government are expected to call for profound reform of the global financial system. Current levels of investments in low-carbon technology and infrastructure are substantially lower than the $500 billion per year thought necessary by the International Energy Agency to hold the increase of global average temperatures below two degrees Celsius – the target agreed in Cancun last year. 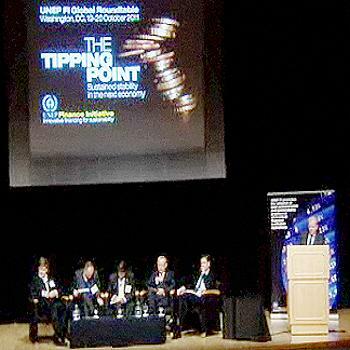 The statement is co-ordinated by three investor groups on climate change – the U.S-based Investor Network on Climate Risk, the European Institutional Investors Group on Climate Change and the Investors Group on Climate Change in Australia and New Zealand – alongside UNEP FI and the Advisory Council of the Principles for Responsible Investment. Investors sent the statement and report to the G20 and other governments ahead of the UN Framework Convention on Climate Change at Durban, South Africa in November/December. The definition by governments of clear short-term, medium-term and long-term greenhouse gas emission objectives and targets and comprehensive, enforceable legal mechanisms and timelines. The creation of lasting financial incentives that shift the risk/reward balance in favor of low-carbon assets. Continued work towards a legally-binding international climate change treaty that includes all major emitters and sets short-term, mid-term, and long-term greenhouse gas emission reduction targets. Support the development of the Green Climate Fund and other comparable funding mechanisms to assist developing countries to mitigate and adapt to climate change. “Determined leadership on national and international climate and energy policy will be fundamental in shifting this risk/return balance in favor of low carbon investments,” said Pfeifer. The investors’ statement is supported by the findings of a report commissioned by the three investor groups and UNEP FI. This report underscores the importance of investment-grade policy which will enable institutional investors to allocate capital towards climate change solutions, including government incentives to compensate for heightened risk and sufficient scale of technology deployment. The report emphasizes that long-term policy stability is critical and retroactive changes can damage investor confidence. “The statement from major private sector investors will help to give governments both the confidence and the knowledge to put the right incentives and mechanisms in place,” said Figueres. 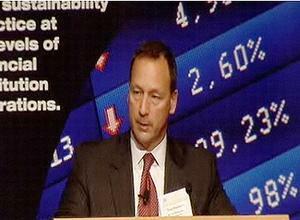 Click here to view the 2011 Global Investor Statement on Climate Change and a list of signatories.